Teak is a tropical hardwood that is found extensively in Southeast Asia, teak is one of the most popular woods for furniture making. Natural beauty and elegance are the two basic reasons for such popularity. In addition, teak is also quite easy to maintain and since it is lightweight most of the furniture and other items manufactured using teak are easily portable. Seen some real bargains out there... whats the catch? The catch is that the furniture you are buying is grade C teak. Yes, even if the retailer double or triple promises on his website or over the phone that its really grade A, if the price of the furniture is too good to be true, then there is a reason for it. Some hide the grade by using chemicals on the timber and others don't even bother doing that counting on the fact that you won't know the difference anyway. (to learn more, see this garden furniture guide) Grade A, fully machine made teak furniture is expensive to manufacture and therefore expensive to buy. As an example, if you have seen a typical 8 seater teak garden furniture set (anything from 240cm - 300cm) for under £1500 then I can guarantee you the set is made from grade C or handmade or both. Yes, it will look fine for the first year but after that you will start seeing the inherent problems with such sets rear their ugly heads. Rickety, weak joints, warped tabletops and rot are not a question of if, but more like when. "Yes" I hear you say, "but these guys have got good reviews on eBay/Amazon/Gumtree (delete as appropriate); How come if the furniture is so bad?" Well, 9/10 the reviews are given immediately after the purchase and not a year later. If you could go back to these people who buy on eBay or Amazon and ask them how their £700 8 seater teak garden set is doing a year after purchase, I guarantee you the answer will be completely different. So how do I know who to trust and buy from? Well, that all depends on what you really want. If you want a real piece of furniture which you will be able to pass on to your children/grandchildren then the only way you can be sure is stick with the 3 or 4 main manufacturers that are well known in the industry as producing the best garden furniture there is. Manufacturers like Gloster Furniture, Faraway Furniture and Indian Ocean are all known and respected in the industry. They all provide good guarantees that show their commitment to their products. They all actually manufacture their furniture rather than just import it and have all been in the business for a very long time meaning that their guarantee actually means something rather than just empty words. If you want real furniture, I would say stick to those three manufacturers. 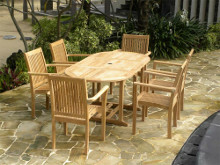 If you want something that you would replace every couple of years, then those £699 grade C teak garden sets will be fine. Well, in that case, I would say that you should not be buying a teak garden furniture set at all. Buying a cheap teak garden set is a complete waste of money. I can guarantee you will regret the decision after only one year. You will look at the set and wonder why on earth you just threw away a large chunk of money on that. £700 might be less than half of what it will cost you to buy a proper teak garden set, but it's still a fair amount of money to just throw away. Ask yourself what you would rather do? Spend £700 on a set that will become rickety after one year, or spend £1500 on a set that will last for generations? Characteristic that makes teak popular for furniture making are as follows. Teak is naturally oily wood. Teak is highly weather resistant. Teak is perfect for commercial use as well as domestic use.. The wood is highly weather resistant. 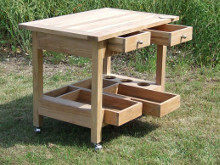 Perfect for both indoor and outdoor furniture manufacturing. It produces natural oil that protects it against vagaries of weather. Teak is highly durable as well as easy to maintenance. As it ages, teak furniture would start developing grey color. With proper care it can last for a life time.